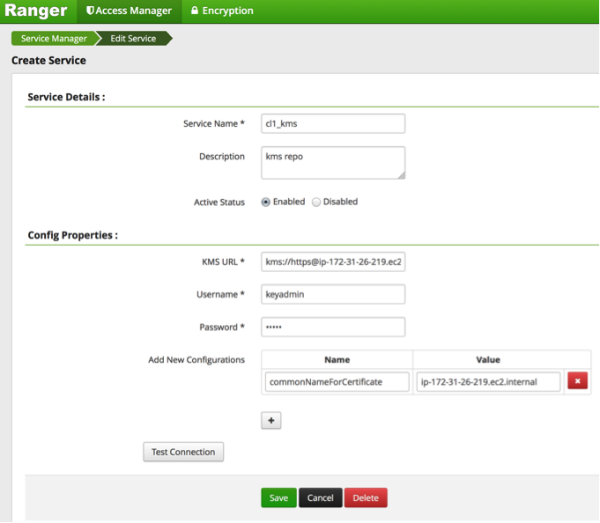 How to configure the Ranger KMS Plugin for SSL, when setting up Ambari Ranger SSL using self-signed certificates. To configure the Ranger KMS (Key Management Service) plugin for SSL, use the procedure described in the task above, and then perform the following additional step. Log into the Policy Manager UI (as the keyadmin user) and click the Edit button of your KMS repository. Provide the CN name of the keystore as the value for Common Name For Certificate and save your changes. This property is not provided by default, so it must be added.